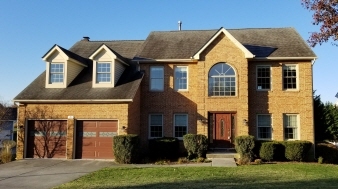 Description: Brick front colonial, 3 finished levels, grand 2 story foyer, hardwood floors throughout main level, quality trim work, formal living and dining rooms, den, family room with gas fireplace. Gourmet kitchen, breakfast room. 4 bedroom, 3 full baths upper level, fully finished lower level with gas fireplace. Large raised deck, overlooks level back yard, evergreens line rear and side. Great location!